A spreading evergreen shrub or small tree. Leaves are attractive,glossy, leathery and aromatic. 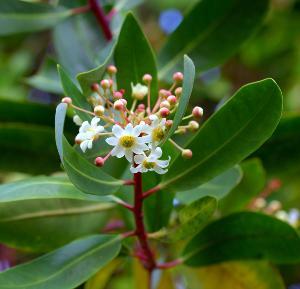 The flowers are produced in terminal clusters of fragrant creamy white during the early summer. Will grow in full sun or partial shade in a well drained soil. Prefers a sheltered position. Supplied in a 9cm pot.